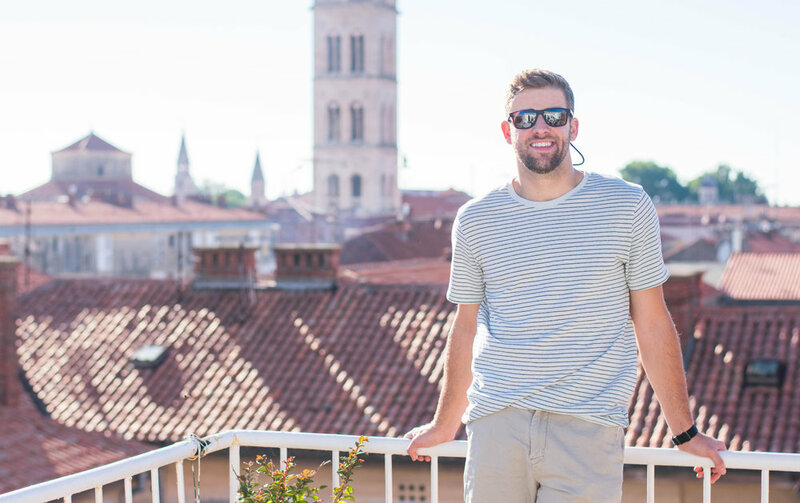 Ah, Croatia -- our absolute favorite trip to-date. It's mixture of history & castles (hello, Italy!) 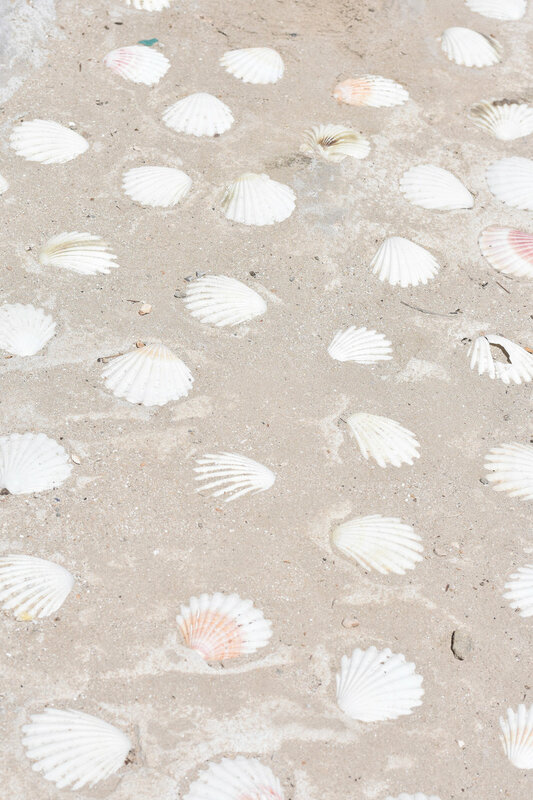 with white pebble beaches & perfectly clear water (looking at you, Thailand!) 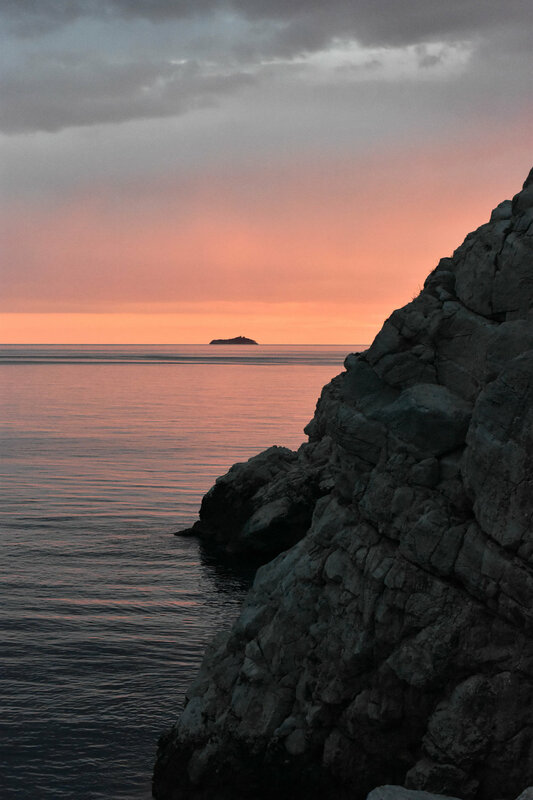 made for a breathtaking, sunny trip along the Dalmatian Coast. I promised so many of you our Croatia travel guide.... approximately six months ago. BUT great things take time, right? Right. 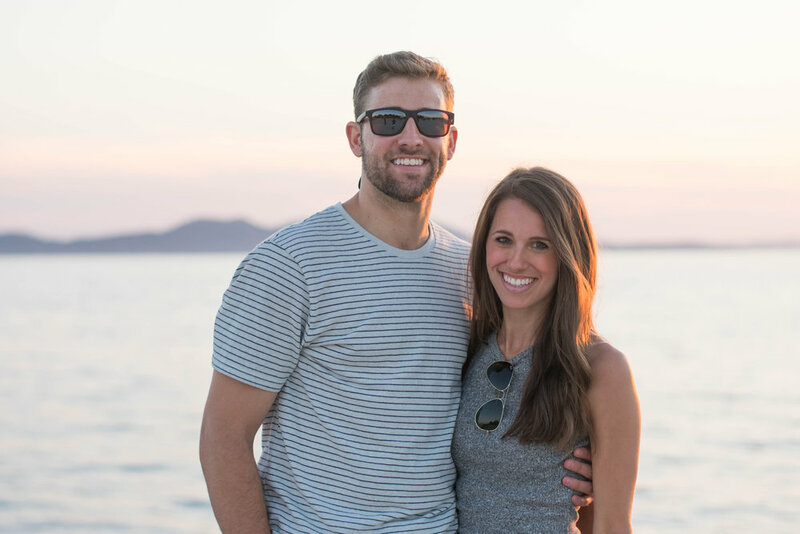 To help, I enlisted a guest blogger -- my travel agent who just so happens to be my husband: Nathan Etheridge. Since he planned the entire trip on his own (without even letting me see pictures of the places we were going! ), he knows all of the in's + out's of our itinerary best. *Note, from Croatia, we flew to Paris for a few days, but we'll create a separate guide for that portion of our trip! Nate here. Heather asked me to put our Croatia trip itinerary together in blog-form, mostly because I don't think she knows half of the logistics involved. She is definitely the dreamer and I am the planner, which is odd because when it comes to just about everything other than traveling, it's the opposite. Pertaining to our adventures, she tells me where she wants to go and what she wants to do, and I connect the dots. Travel has become a real passion of ours, starting with our first international trip together to Southern Europe along the Mediterranean coast (Spain, France, Italy), to our honeymoon in Thailand. This is our first attempt at recreating our trips - firstly to serve as a memory highlight reel and secondarily as a guide to future travelers. Unfortunately, our first two big trips were pre-HEP and the iPhone/GoPro photo quality aren't up to the boss' standards. 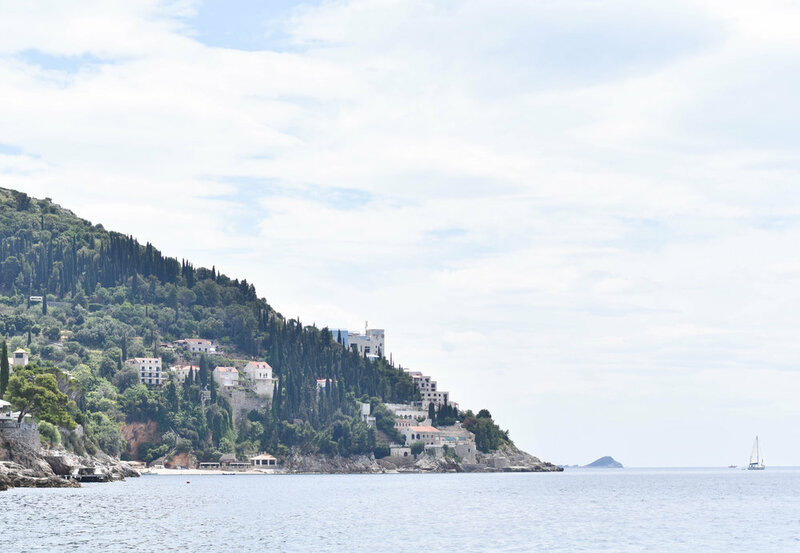 So we are starting with Croatia - which is fitting because not only was it our favorite, but also happened to be the trip we pre-planned the least. The lack of preparation stems from being elbows deep in a complete home renovation (H has just informed me this will be my next blog assignment - yes ma'am), launching a new business and figuring out this whole marriage thing. I think those might be the reasons why this trip was so special. 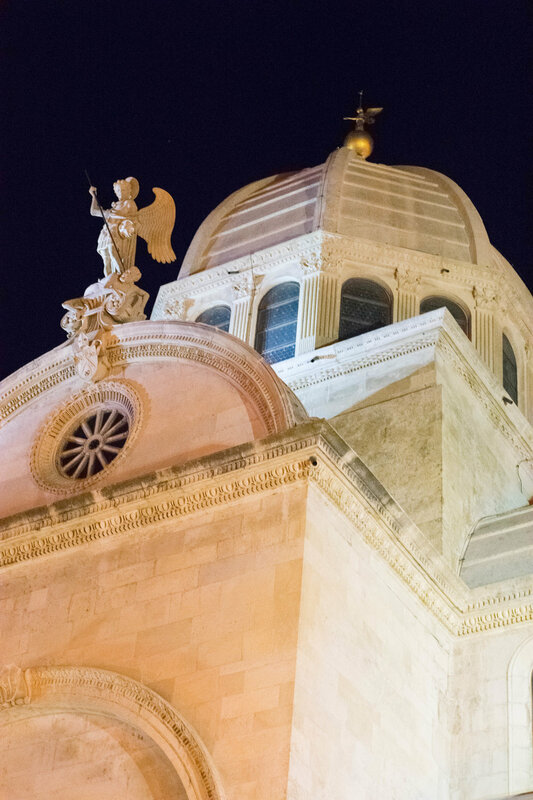 We were at a point of over-extension and in the midst of a pressure-breakdown when we booked flights to Croatia on-a-whim (as a light at the end of the tunnel). The high-speed train we were on took us to this light quicker than expected and this excursion was a well-needed break from the responsibilities awaiting us in real-life. With that - below are some general tips and information, followed by the meat of guide with location-by-location breakdown (including where we stayed, what we did and where we ate). Travel Info: Traveling the world can be expensive and prices-out many travelers, especially younger ones. We are fortunate enough to be able to travel using a combination of H's hotel discount through her employment at IHG (incredible perk of sub-$100/night rates at 5,000+ global properties) and my incessant accumulation of Delta SkyMiles (Delta offers numerous ways to earn this reward currency; from actually flying, to co-branded credit cards, shopping portals, partner earnings and even casual dining-out). Only H can use the IHG employee discount, but she can share her Friends & Family rate. For Croatia though... it was a bit more challenging to say the least. First of all - there are ZERO IHG properties throughout the whole great country of Croatia. This highlights both a huge positive and negative for traveling to the area. A positive because Croatia remains natural and pristine - there is very little over-commercialization and the country hasn't become densely crowded. It also means we had to get creative with lodging - which wasn't too difficult utilizing Airbnb. I would recommend every host we stayed with - some were simple, inexpensive and close to the action, while others offered stunning hillside views of ancient castles and the one-of-kind rich blues of the Adriatic. For $40 Airbnb credit, use our code when booking. 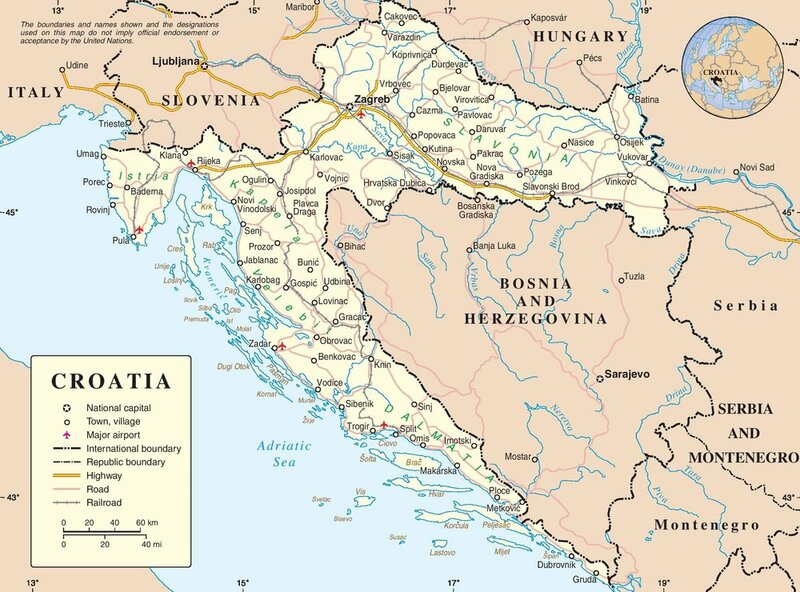 To add to the travel logistics challenge, our airline of choice, Delta, typically flies into (our preferred beginning city in) Croatia once a month. Once. Being flexible in reward travel is key to being able to keep costs down and make the best plans possible. For this reason, I would recommend flying into a European Delta hub (Amsterdam, Paris, London, Brussels or Frankfurt, for example) and then catching a cheap inter-European flight on a budget carrier (we used Ryanair - the largest). Just don't expect peanuts and a soft drink with these carriers and make sure you pack light (always a battle with H when we are packing), but for sometimes as low as $10 a flight - these are great options. Once we landed in Croatia, we picked up our typical European high-MPG rental car. We rented from an international German company, which is becoming more prevalent in the US, called Sixt. They are great - the company is turning into my favorite for car rentals. Like most car rental companies they will try to inundate you with travel insurance and add-ons though, I always decline, but that might bite me in the rear one of these trips (almost on this one). 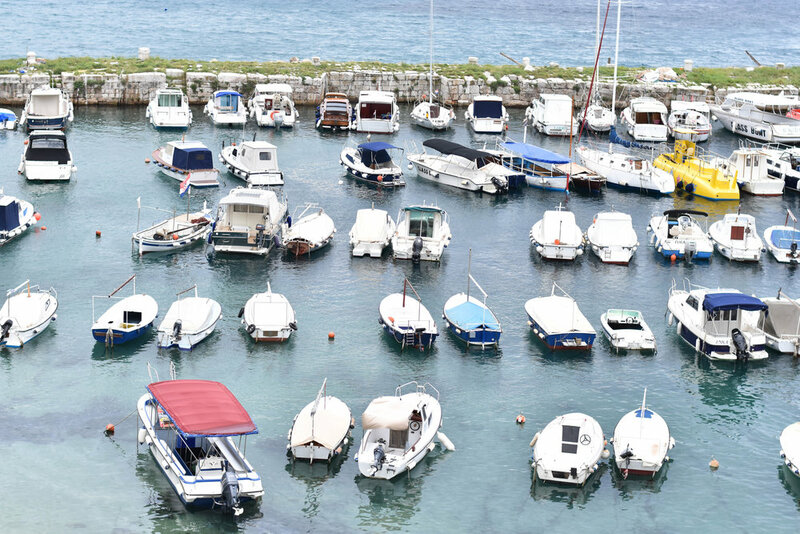 It is also possible to get around Croatia without a rental - through the combination of public transit, ferries and Uber. Uber was super handy before & after we had our rental car, and if you've never used Uber, click here for a $20 credit. Another challenge when traveling internationally is getting local currency. For Croatia - that is the Kuna. I feel like every Croatian word is fun to say - this is definitely one of them and we have substituted Kuna for dollar after our trip. Generally, I feel the best way to get cash is while on the ground in the country, preferably at a banking institution-affiliate to your home bank. Banking with Bank of America is helpful in this regard - they have partner banks all over the world. With no relationship - there is usually less than $10 in fees at an ATM, which most often is a much better conversion ratio than exchanging at the airport or while you are still in the states. One last bit of general info and then we'll get to the good stuff. We decided to fly into Zadar and work our way south eventually flying out of Dubrovnik. This route and location by location sequence worked best for our itinerary, but you could just as easily go the other direction (Dubrovnik to Zadar, South to North). STAY: We stayed in an Airbnb right in Old Town with a bustling street market below, filled with fresh produce and locally caught seafood. Staying on the peninsula is recommended with everything being walkable and centrally located. Ocean High Dive -- Not positive the name of the place, but know it is close to Kapielisko (I think this is the restaurant name, which also has a great view). We stumbled upon it after leaving the old fortress due to the commotion of what sounded like a good time. There are two ocean-pools for water polo and/or swimming laps and one Olympic-sized diving platform out into the ocean. Two dozen or so school-aged locals were playing in the pools and swimming, but only a handful were brave enough to dive off of the platform into the Adriatic. We didn't have bathing suits on or I would have definitely gone off the top (or so I say). We recommend this place either for the adrenaline rush or the great views of the coastline. Sea Organ -- If you follow the coastline from the high dive, you will come across a boardwalk that leads all the way to the Northern tip of Old Town. Along the walk, you will pass many cafes and waterfront establishments. 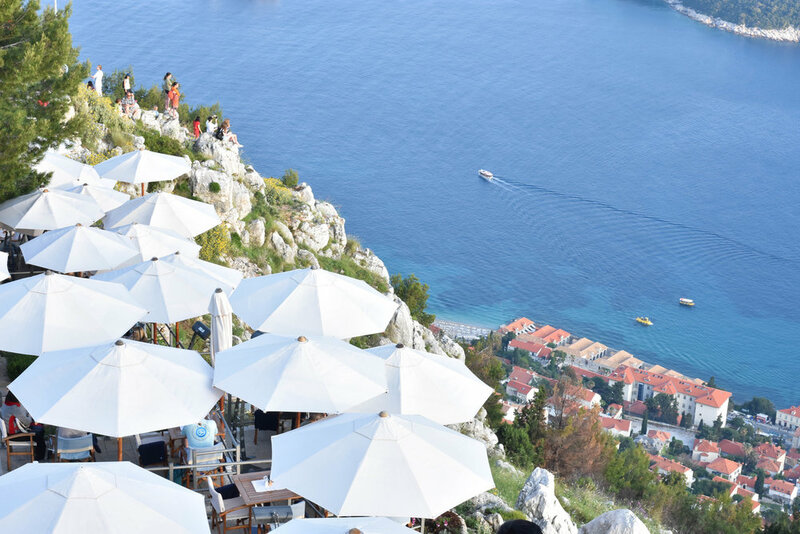 Typically, you will find us on a rooftop enjoying a cocktail at sunset, but we recommend grabbing a Croatian beer or local wine and heading to the last two places on this list for a one-of-a-kind sunset. The Sea Organ really is an incredible attraction. The organ is built into a set of stairs on the water, and produces a soothing melody whenever the waves crash through it. It is a romantic and picturesque spot like no other we have seen in our travels. Greeting to the Sun -- Within ear shot of the Sea Organ, is the solar-powered Greeting to the Sun which comes alive after the sun goes down and turns into a studio 54 like surface. It is a perfect spot for dancing (a favorite H activity), and most nights there will also be some music being played through speakers or by street performers alongside the organ. EAT: According to the internet, there has been an explosion of dining options over the last few years in Old Town Zadar, but we couldn't decide on a spot beforehand. In these instances we rely on the locals for recommendations, which rarely lets us down. 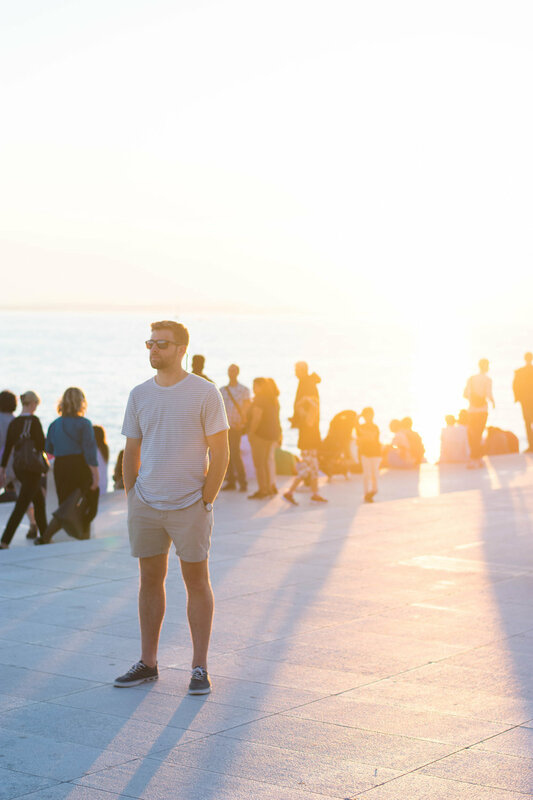 Over and over we heard the same restaurant recommendation for Zadar. Everyone we spoke to recommended a Italian-inspired restaurant with Croatian-infused style called Bruschetta. The recommendations were spot on and it was one of our favorite gastro-experiences of the trip. The ambiance was modern and sophisticated with an outdoor terrace and waterfront views (which made H pleased) and the food was delicious and generously-portioned (which makes me happy). Stay: There are some Airbnb and local motel options close to the park, but we elected to drive our 4-cylinder car-scooter from Zadar for the day and then went on to our next destination, Šibenik, for the night. General Info: Make sure you have directions to the park because it was a bit challenging to find, even with our international iPhone. We parked in the first entrance and paid the daily fee (around $7) and made the half-mile trek to the park entrance. There are some food options, but like most days we spent exploring, we packed a sandwich, fruit and water. 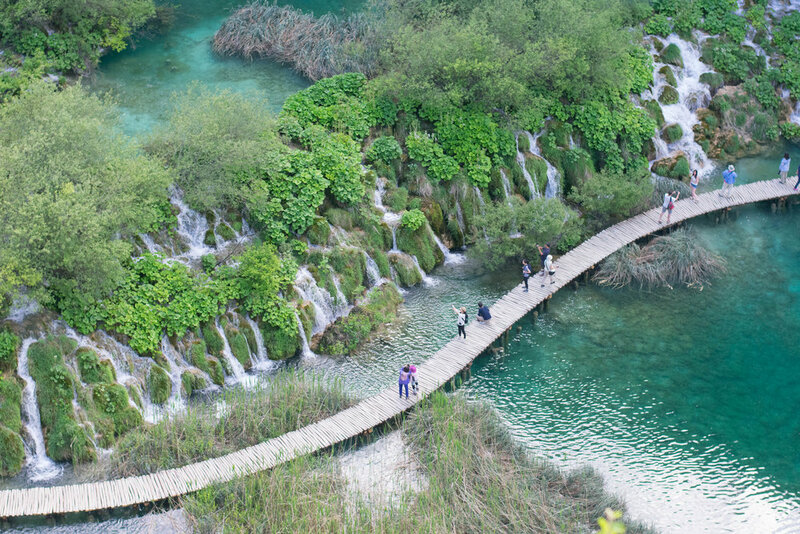 Do: Plitvice National Park is a national treasure in Croatia and they do one of the best jobs of protecting its beauty compared to anywhere we have been. There is no swimming in any of the miles and miles of crystal clear blue waters - which was an incredibly difficult rule to follow because the water is so inviting. If swimming is your thing, Krka National Park (see below) has an area that swimming is allowed, thank goodness. As you approach the front entrance of the park (entrance fee ~$15), there are two park employees handing out maps at the beginning who can assist you to decide the best route to take (there are many and the park is so vast that it could take over an hour to get to the other side if you go the wrong way). We chose route F (takes 3-4 hours and roughly 2 or 3 miles), which went along the water and to the largest waterfall, but contradictory to what I just wrote, there are no wrong paths - the whole park is a majestic and stunning site. After walking through the gates, you are directed to a dock on a large lake (depending on which route you are taking). This is the launch-point for the ferry that will shuttle you to multiple stops depending on the route. For route F we disembarked at the last stop - all the way across the lake to the Lower Lakes. From there, follow the inevitable groups of people taking pictures with their iPads, disposable cameras and even calculators? Crazy tourists. Follow the paths to see all of the sights and wildlife (including a detour up into a 5-story cave). The boardwalk over the water gets congested at times - we once got stuck behind a group as they watched a snake engulf a fish (which H was also enthralled with). At the far-end of the path is the largest waterfall: Veliki Slap (great name, really fun to say), which you can get right next to for a photo-opp. After the waterfall, head back up the gorge to a small roundabout with an ice-cream stand. From there, a train-bus takes park-goers back to the entrance of the park. 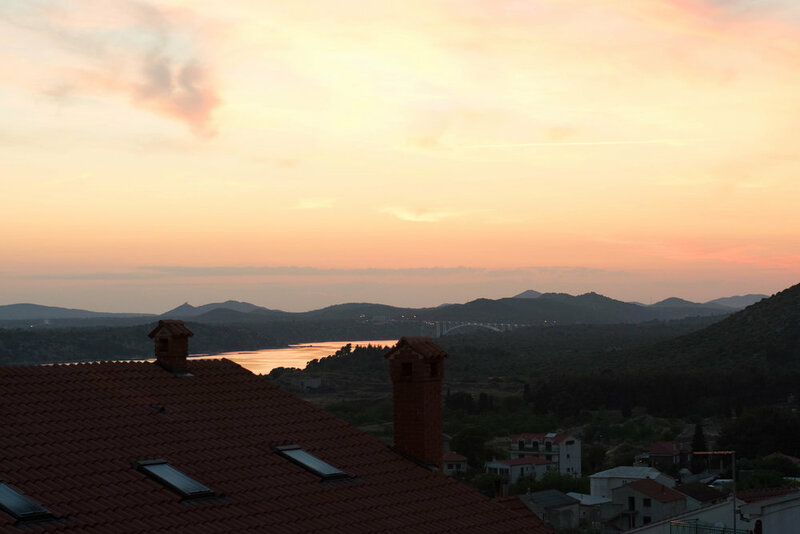 STAY: We only stayed a single night in Šibenik at an Airbnb close to Old Town on the hillside, which boasted a phenomenal view of the harbor at sunset. From our accommodations, it was a quick stroll down the hill to the main part of town where most of the shopping and dining along the seaside are. After visiting the city, we definitely could have enjoyed more time there, including a day trip to the Kornati Islands. It is also a perfect home base for exploring the parks mentioned which is what brought us here in the first place. St. Michael's Fortress -- It only takes a quick glance up from anywhere in Šibenik to see this fortress. It is one of many and the most predominant stature-wise and its placement atop the hill overlooking the entire city. It wasn't until the fort was lit up following sunset that we learned it is now an open-air amphitheater - hosting concerts throughout the year. Going to an event here would be special and something I wish we had planned for ahead of time. Old City Hall -- As you venture through the city streets, making your way towards the water, you will come across an open Roman-style forum with the Old City Hall at the center. This open area was quite a site and had I been dropped in blindfolded, I would swear I was in the middle of Rome. Explore this area - there are many dining options and music playing - which of course led to awkward public slow-dancing by H.
Cat Chasing -- This is the oddest recommendation thus far, but we spent a good half hour (and by we - I mean Heather) chasing stray cats through the streets of Šibenik. These mangy alley cats were actually good tour guides taking us through a grave yard and through some of the residential district. By the end of the tour, we ended up within earshot of a live band and found a great outdoor live music watering hole - which... just happened to be right next to a gelato stand. We listened to the live music and ate our daily fix of sweets, and then headed back to our Airbnb. EAT: We didn't plan anything for dinner while in Šibenik (due to uncertain schedule), but we did come across two restaurants near Old City Hall that were highly recommended. We opted for a casual mom + pop pizza joint with an outside patio and Croatian table wine. Our waitress knew zero English and we had to order through hand gestures and pointing. The food was delicious, though and I think we really connected with our waitress by the end of the meal. STAY: We decided to drive onto our next destination, Split, which was about a half-hour drive (the highways felt like the Croatian autobahn - if you had the engine capacity). I don't recall seeing any Airbnbs close to Krka and the areas surrounding the park didn't feel like the most tourist-friendly spots. DO: I almost labeled this section "DON'T", but H has me following a strict structure. As we were packing-up our bags to head to Krka, a sneeze while bent over threw H's back into a fit and we damn near had to cancel the whole day-trip to Krka. But, she fought through the geriatric ailment (see above photos with one of her hobbling through the park) with a few stints of being thrown over my shoulder and carried. And are we glad she did, because Krka National Park was one of our favorite days and one of the most impressive sites we've seen during our travels. (Note from H: Nathan intentionally left out the part of this day when he ever-so-gently rammed our rental car into another while driving down a steep one-way road, but I'll let it slide.) OOPS. (Sixt didn't notice the scuff fortunately). The park is situated in the middle of nowhere Croatia and it was a head-scratcher to get to at times. There are two entrances to the park, distinguished by how you enter - one entrance came in by ferry and the other by bus. We chose the bus because it was quicker and closer/easier to get to by rental car. After paying the entrance fee (~$15), a bus shuttled us through the rolling hills and down to the entrance. 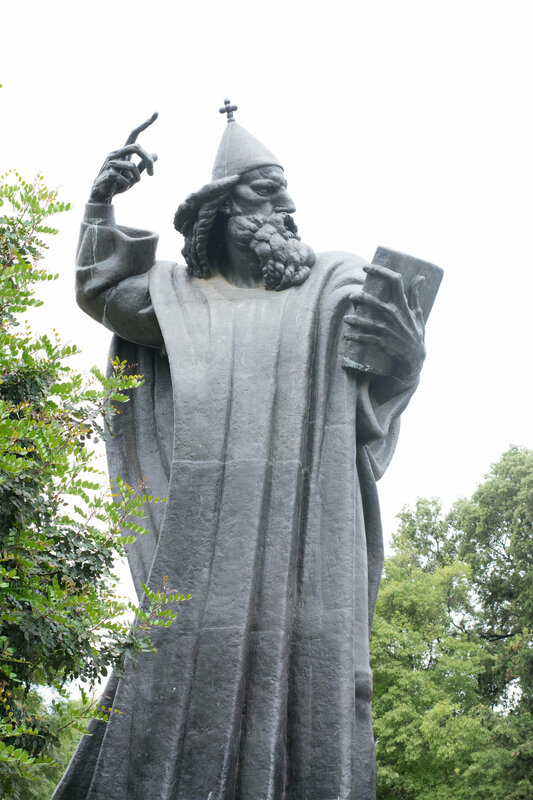 The portion of the park that we explored was called Skradinski Buk. Skradinski Buk -- The trail totals a smidge over 2-miles of walking trails and wooden pathways that wind over swamp-like terrain (but not like gross brown Georgia swamp, more like a crystal-clear blue lagoon). Along the way there are places to peel off and capture viewpoints of the waterfalls, lagoons and one particularly beautiful swirling whirlpool. There is even a spot off the pathway for deep-stretching and massages for thrown-out backs (nothing to see here people...). The culmination of the hike is the last, and one of the most impressive sets of waterfalls in the park. This is also the area designated for swimming and a great photo opp. We, unfortunately, didn't get in the water as a flash afternoon rain bout dropped the temperature a good bit and Quasimodo was ready to get off her feet and back to the car. The temperature and our health could have been better, but the sites were still unforgettable and we would definitely recommend a visit. EAT: Ditto what we mentioned before - for adventure days like this we always pack lunches from local delis and eat them on the trails. STAY: We stayed in an Airbnb about a ten-minute walk from Old Town (just about every location we went to had a "Old Town", confusing and even more so - some of them were referred to as "Starigrad". You see this all throughout Croatia) & would highly recommend doing so as pretty much everything is walkable here. Diocletian's Palace -- Split is such an interesting town. It has all the modern amenities of a well-developed destination, but is infused with ancient landmarks and history. The best example of this is Diocletian's Palace, which is smack dab in the middle of the "downtown" area. Definitely explore inside the castle walls & go to the top of the bell tower (unless you're claustrophobic) for amazing terracotta-roof views of the whole city. Kavana (Café) Lvxor -- This place is inside the castle walls and serves as a cafe restaurant during the day. At night, the cafe turns into a bar and opens into the courtyard with seating built into the side of the castle walls. Both nights we were in Split they had live music after the sun went down in the open area. The atmosphere was quite romantic and humorous at times when the older folks got out there and let the Croatian vino take over. Highly recommend, a must see and do while in Split. Beaches -- Every website we researched recommended Bavice Beach, but we got there & were very disappointed. It’s essentially a dirt beach with brownish water. (I think it might be a fun party spot at night, but not what we were looking for at noon on a Tuesday). We hopped in an Uber for a 5 minute ride to another beach we had heard some local-youth talk about. The difference was like night & day - crystal clear water, white pebble beaches, a string of 5-6 trendy beach bars. Exactly what H wanted and I definitely enjoyed it as well. It is called Znjan Beach and it is a must-beach spot. Bike -- We rode a trolley to tour Majan Park, and we wouldn't recommend it. It was more for families/kids and it doesn't give you the leeway to stop & explore. I would recommend renting bikes instead and ride around the park, making sure you stop for some amazing ocean views. Also be sure to go all the way to the peak of the park for a lookout view over the whole city. Sunset / Drinks -- VIDILICA. The views from here are some of the most amazing of the trip and some of the best we have seen at a sunset spot. The bar/cafe has a picture frame view overlooking the city and marina, from an open-air terrace. We went around an hour before sunset to get a front row seat of the views. EAT: Our first night we went to Restaurant FIFE & it was great - local, family-run, traditional Croatian food with huge portions. On night two we wanted a taste of home & went to Toto's Burger Bar right on the water & it was probably one of the best burgers I’ve ever had. We would recommend both. For dessert? more Gelato – get it. Every day. Twice a day (That last recommendation is from Heather, she loves gelato). 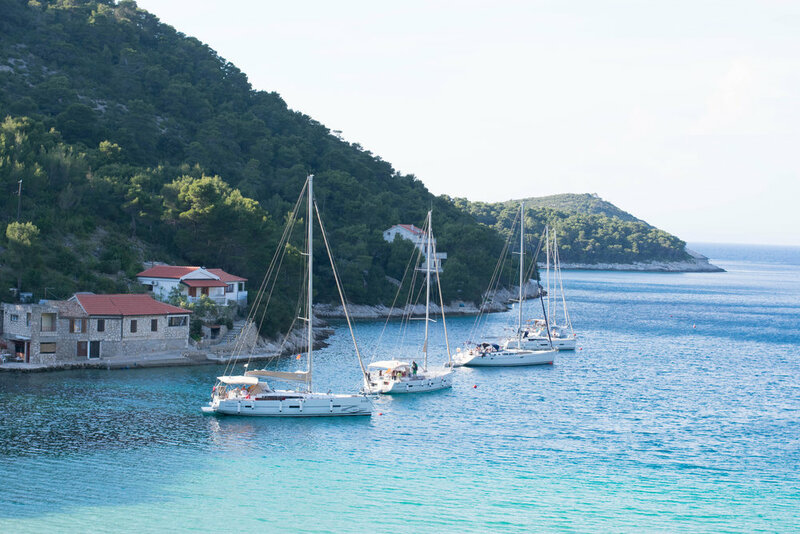 STAY: Vis was the most commercially-untapped residential destination we visited in Croatia. The whole island has a "mom & pop" feel. You definitely won't see any McDonald's or Starbucks here. We found a great Airbnb a stones throw from the ferry port & marina, but high enough to take in the stunning views of the crescent-shaped bay engulfed by the rocky hillsides. The ferry schedules are peculiar in that the times they run from surrounding ports to Vis are limited (ex. the ferries only run on certain days & at not-ideal times for tourists - I think they are more customized for locals who work outside of Vis). The schedule worked out that we couldn't get to the island any sooner than early afternoon and then set sail the next day (at the crack of dawn) or extend our stay multiple days. 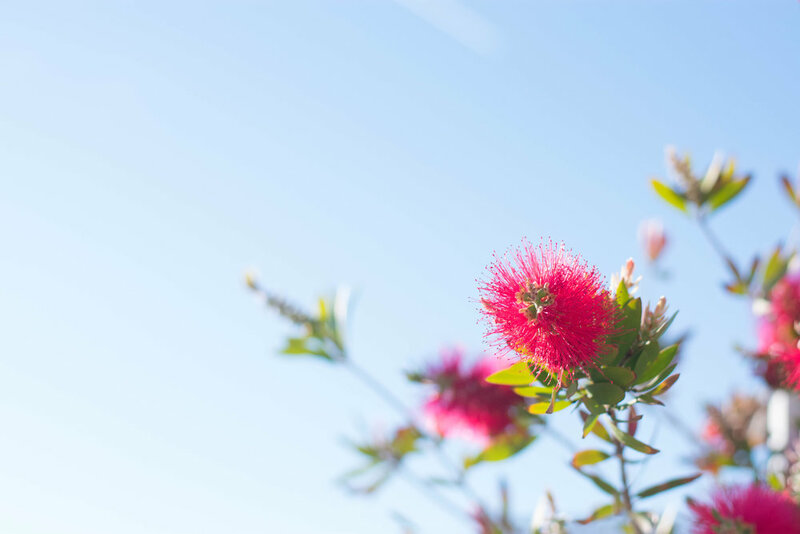 If possible, we HIGHLY recommend dedicating more than one day, or a whole season, to Vis in order to take in everything the quaint island has to offer. Rent a Beachy 90's Convertible -- There are amazing things to do and see in Vis, but number one on this list, for us, has to be renting a "Clueless"-style soft-top to explore the island. This was one of our favorite experiences and, although it's a bit more expensive than renting scooters, (unless you factor in the ER bill and time spent in recovery...lesson learned in Thailand) the rental still only comes out to around $30 for the day. There are multiple rental shops steps from where the ferry embarks and you can also rent scooters, scuba gear and boats, and book expeditions to local destinations. The whole island is only a couple of roads so grab the keys, throw the top back and go (...and if you're H, situate the GoPro just right to get that cruising shot). Stiniva -- Stiniva is like nothing we have ever seen. It reminded us of the Calanques in the south of France, but a bit more grand and off-the-beaten-path. There are two access points to Stiniva: either by land or sea. 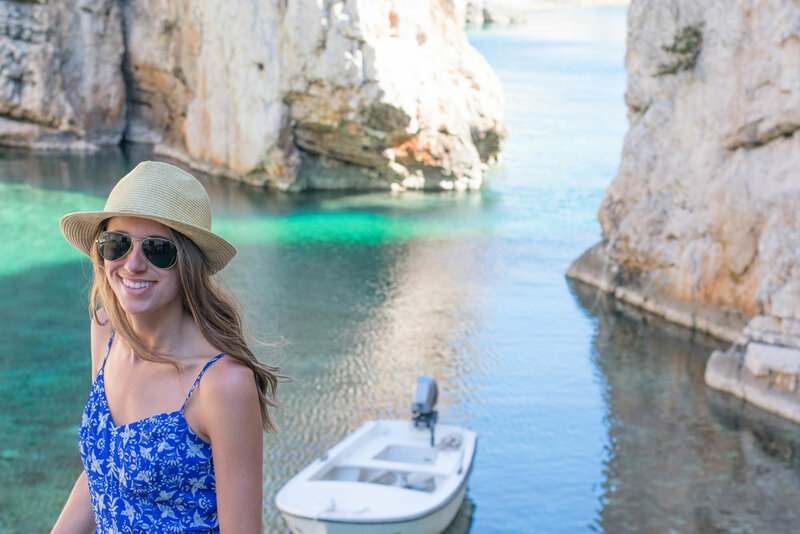 Had we had more time, we might have opted for a day-long boat tour around the island, but then we would have missed out on the view from above Stiniva on the road, leading to a half-hour trek down the hillside. Once you reach the bottom, there is a pebble beach and small shack selling food/drinks. The beer was only marginally marked-up, which seems like bad business to me because I would have traded H for a cold-one after the descent. But, I feel like that little hut encapsulates Croatia as a whole - they could price-gauge and take advantage of non-locals, but they embrace visitors and treat them like their own (maybe my favorite thing about the country and its people). Lounge on the beach, eat your picnic lunch (if you packed one) and swim through the opening in the rock out to the deeper water (but look out for prickly spike creatures...urchins?) and then head back up to your Cabriolet. Vineyards -- As you circumvent the island on it's two-lane, unmarked roads, stop into a vineyard or two and sample some delicious domestic wine. All of the vineyards seemed family owned and have been around for generations. The wine was amazing and, to my delight, as inexpensive as bottled water. Water or wine? Easy choice. Blue/Green Cave -- These popular tourists spots are only accessible by boat and, much to our disappointment, we weren't able to get a boat in time. I have heard amazing things about these two grottos and would highly recommend going. Both can be seen by boat expedition from Split and Hvar, but I would recommend staying in Vis an extra day and dedicate it to them. Stonica -- We hiked above this sea inlet, after driving from Stiniva, but it isn't very impressive from above - I have seen pictures from the water looking up and it is a much better sight. If you rent a boat to see the grottos, make sure you stop off here for a bit. While we were hiking above the cove, we saw multiple yachts anchored here - feels like a secluded spot for the fancy travelers (Beyonce?). Marina -- After your long day of exploring, drop the wheels back off (after filling up with gas at what is possibly the only gas station on the island) and go by foot to explore the marina. This is the "downtown" of the island and is peppered with wine tasting spots, shops and restaurants. This is a great area to take in sunset, with some local vino and then sit down for some fresh, locally-sourced seafood. EAT: Strolling the boardwalk at the marina there are numerous options. Take the time to walk down and back to check out each menu for what sounds best. There are helpful maître d's at the entrance to every restaurant, who can answer questions you will undoubtedly have. We selected a family-run establishment that served local Croatian cuisine on the stone steps of a pathway heading upwards into town. It was like no restaurant we've eaten at in the states, built into the city and with views of all the docked sail boats. STAY: Again, we stayed in an Airbnb in Hvar. There was at least one boutique hotel option and a mini-resort, but I would go the home-sharing route. Our host in Hvar was lovely and quite helpful. Her villa was atop the coastline and there was an unbelievable view over the harbor. The walk up the stairs may be strenuous on the calves, but it was worth it for the view and the privacy at night when the harbor party-scene was still going strong. 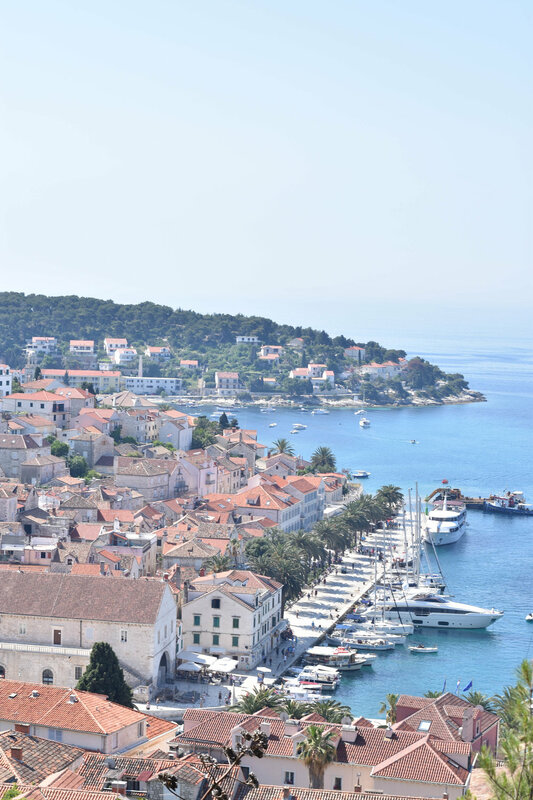 Explore the Palenki Islands -- I think the best day of vacationing we have ever experienced was our first day in Hvar and a lot of it had to do with exploring the islands just across the way from Hvar. There are two options here: 1) is to ride the boat-taxis back & forth to limited locations or 2) is to rent a boat and captain the high seas yourself. Needless to say, we went the self-captaining route. There were multiple levels of boats you could choose from - a 5HP engine dingey up to a small speedboat. The first two beaches we explored were Zdlrica and Mlini. They are about a half-hour ride from the harbor (at dingey speed) and are amazing pebble beaches with wine-tasting rooms, beach bars and big bean bags to lounge in. Grab yourself a refreshing peach daiquiri & relax on your bag or private cabana, then head to the next beach - our favorite. Palmizana (or as H pronounced it - "Parmesan") is right around the corner from the first two beaches and is more of a cove. Filled with hip restaurants, cabana-laden docks, art galleries and anchored-yachts - this area is ritzy and upscale (right up H's alley). Dock and head along the connected docks, down to the sliver of beach and keep walking up to one of the restaurants. We stopped for lunch and drinks at Bacchus, which boasted an open air 180-degree semi-panoramic view above the cove. It was breathtaking and had a great breeze blowing across the patio. We relaxed here for a long time and put down some wine... then back to the dingey! There were a number of other inlets to explore, but with a limited number of horses pulling our carriage - we opted to check out the last "close" spot then head back to harbor. Carpe Diem -- Seize the day! This bar (more like a watering hole compound) has an island all to itself. We didn't go at night when it is banging, but even during the day this place is like no other we have ever seen. It's like an outdoor jungle dance club that is intertwined with the trees and coastline. They have multiple bars, swimming pools & stages for performers. This, and the other most popular bar in Hvar, were the only places I felt the impact of it's awesomeness reflected in the drink prices - worth it though. Hula Hula -- The second most popular hangout establishment in Hvar is Hula Hula, which is a short walk from the main harbor. If facing the fortress - walk to the left around the harbor and then through the "resort" along the water. This is a great walk in itself and eventually you come up to the infamous sign and you are there. Hula Hula is built into the coast and over the rocks separating land from sea and is a great place to be for sunset. Grab an overpriced drink from a scantily-clad server and unless you are partying - head back to the harbor for dinner. Fortica -- Hvar served as a crucial outpost for Croatia back in the day and atop of the island overlooking the harbor is a brooding stone structure called Fortica. We hiked up to the fort early in the morning (after a night-full of "helmet shots" -- see below) so both of us were dragging a bit and not fully enjoying the view - that was until we reached the top. Both the view and the breeze were like a shot of Pedialyte to the heart and immediately made it worth the trek. It is a few Kuna to get into the castle and worth every bit. Scooter-ploring -- If you have time, rent a scooter and tour the rest of the island (Hvar was actually much larger than I thought, even though the harbor and the islands were my favorite parts). Three places we would recommend seeing are Dubovica Beach (not as impressive as the islands, but a scenic and nice pebble beach worth visiting), the lavender fields in Brusje (if they are in bloom - season stars in early summer) and Old Town (we didn't make it here - it is the furthest away and we got some afternoon showers, but heard if you are a history enthusiast - this is the place for you). Party -- Hvar knows how to get down. If a particular friend of mine ever gets engaged - this is where we are going for the bachelor party (pending H approval). There are bars everywhere (two we've already mentioned) and there is a young/fun attitude in Hvar. It is also is a hangout of the Rich & Famous, if that paints a picture. One bar that you must visit (even though you'll probably have to fight through the crowd of grinding European teens) is called Kiva Bar. The bar is close to the harbor and boasts a right-of-passage shot called the "Helmet Shot" (a must-do). The bar also plays great mashup music, which I am a big fan of. Also, the patrons at the bar will almost certainly have zero clue about classic-American dance-moves so freshen up on the Carlton and prepare for imitation and lots of high-fives. EAT: I don't care what you read on the internet about where to eat or what your uncle swears by - if it isn't Dalmatino Hvar then you are off the mark. It was the best meal of our trip and that's not because we left drunk as skunks off of local Croatian aperitif & digestif liquor (on the house) and a carafe or so of Dalmatian wine. The food, first and foremost, is the reason I wish I had more hands - to give this restaurant 5 thumbs up. Bundle that with the spirits & the family reunion-style service, and you've got yourself a recommendation. STAY: You might be sensing a common theme here... once again we stayed in an Airbnb and it was perfect for what we needed. It was just outside of the castle walls of Old Town and up the hillside a bit - high enough that the view from the terrace included everything inside the walls and all of the coastline. It was but a 5 minute walk down to the action and about the same to the airport shuttle bus pick-up. Rent Kayaks -- Right outside of the Old Town walls, there are a number of kayak tour salespersons and they are reasonably priced so pick the friendliest looking and rent yourself a kayak. We wouldn't recommend doing a tour as it is more expensive than renting a single kayak and you have to stay with a group. There are three attractions you can kayak to and it would be difficult to get lost - so there really isn't a need for a guide. They give you a map of what to see, those places are listed below. Lokrum Caves -- Lokrum is the uninhabited island right off the coast from Dubrovnik and it is also a must-see. 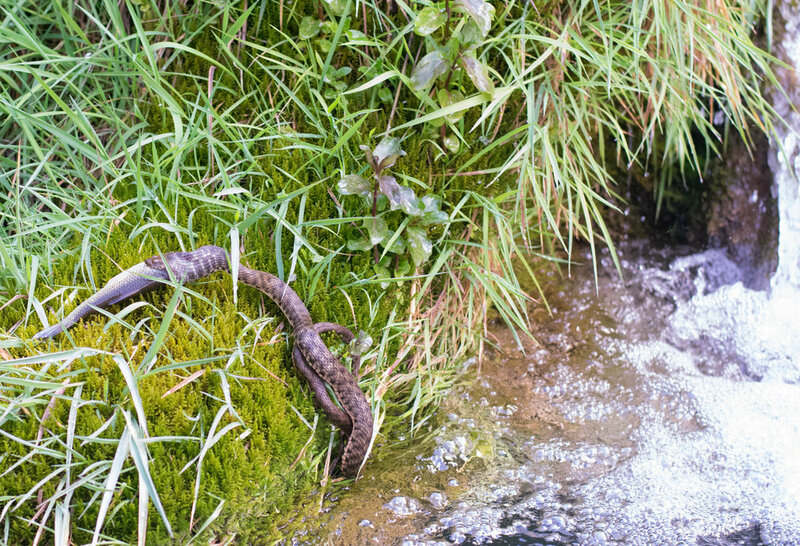 It will be the first thing you see on your self-guided kayak tour. If you stay close to shore, you will see all of the caves of the island. Spend some time at each, either exploring the depths or rock jumping. After getting half-way around the island - there will be a point where its possible to dock the kayaks and go ashore (I think this is against the rules, but we did it). Lokrum -- If you make it ashore during your kayak expedition, make sure you see the peacocks and check out the Dead Sea (an idyllic swimming hole). But, don't spend too long because once again, I think it is against the rules and you don't want to leave your kayak unattended for too long. If you have the time, spend a day exploring Lokrum by riding the ferry to the island (as with most natural parks in Croatia there is a small entrance fee). As you round the island on your kayak beware of the old man German nudist beach - nein danke! Continue back towards the mainland and you should run into our favorite part of the kayak trip. Secret Cave Beach -- This beach/cave is only reached by water (and maybe by repelling down from above) but this is a good thing, because it would be packed at all times if easily accessible by land. The cave is maybe 100ft. high and about the same depth. 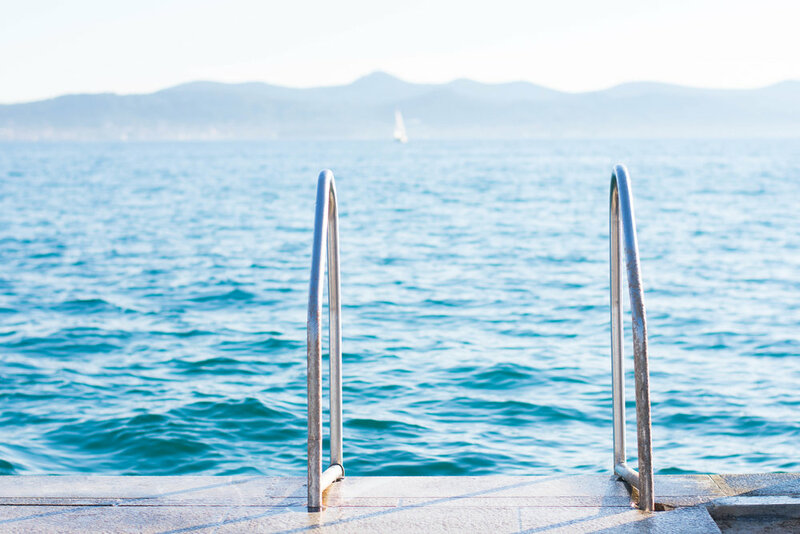 Possibly the best part of the beach are the rock structures along the opening that serve as perfect diving boards into the Adriatic, or maybe it is the seclusion or stunning views. I couldn't talk H into cliff-jumping with me - and I have to be honest, I hesitated before jumping when I reached the top. A must-do. After enjoying the cave, head back to the cove where you rented the kayaks and then on to the land activities. Walk the Castle Walls -- There is a reason Dubrovnik is consistently featured as a backdrop in Game of Thrones. The downtown area is enclosed by giant stone walls and it feels like you walked right into medieval times. The Old Town serves as the setting for Kings Landing and GOT fever has swept the historic town. The best way to tour the town and filming locations is the wall tours. There are two main entrances into Old Town and the entrance from the North leads you right to the entrance of the top of the wall. After you walk in, the office to purchase your tickets is to the left, I can't remember the exact entry fee, but it is high (from a Croatian standard), maybe around ~$25 per person. BUT, it is most definitely worth it. The complete lap around the fortress takes a few hours and is full of sweeping terracotta rooftops, adjacent fortresses and views of the sea. There are a number of photo-worthy spots atop the wall and a number of scenes you might recognize. Game of Thrones Tour -- We didn't actually book one and I wouldn't recommend doing so, but... it is pretty easy to spot a group and follow them for a bit to see some of the filming locations. GOT has taken over Dubrovnik and there are souvenirs, gift shops and GOT-themed everything - everywhere. Get a shot on the iron thone or with a Tyrion statue. Buza Bar -- One of the coolest bars we've ever been to. There are two locations and they are not easy to find. The main bar entrance is on the South-West part of Old Town, a few levels above ground-floor. There is a little sign for the bar (yellow and says "cold drinks with the most beautiful view") and then an opening in the stone wall seeming to lead to a long fall to the rocks below. As you enter through the opening, you find yourself on the side of the cliff, right over the crashing waves below. We went for a stunning sunset, but if you go during the day (which may be less crowded), also bring your bathing suits because this is a great spot to cliff dive. Cable Car -- Possibly the only view in the city better than the walls, is on top of the hill after riding the cable car. Once again, the ticket to ride the car is expensive, in Croatian terms. It is similar to the entrance fee to the walls. The trip takes about10 mins to get to the apex and is as popular of an attraction as the wall tour - so expect crowds and lines during the high season. There is a museum and restaurant at the top, but I wouldn't splurge to eat up there, even though the views are incredible - just catch a phenomenal sunset and head back down. EAT: There are seemingly limitless options for dining in Dubrovnik, which can be daunting to narrow it down, but we elected to use what my family calls the "Etheridge Method". This consists of strolling the streets and waiting for either that right place to come along or for H to succumb to the hunger and turn into a Gremlin - then the choice is simple, whichever establishment is closest. We did this method both nights in Dubrovnik and went one for two. The first night, Gremlin H decided on an underground pizza place just outside the walls of Old Town. I thought it was pretty decent and low-key. The second night - we ate right off the main stone plaza in Old Town at a family-owned restaraunt. I would recommend going this route, even though most online references say to avoid the "touristy" spots inside the walls. It was more expensive yes, but there was nothing like eating right off the main strip. It has been a great trip down memory-lane recreating our trip into blog-form. If you are still reading, then kudos to your dedication and concentration - this guide has certainly become longer than intended, but hope you enjoyed it. Be on the lookout for more to come and if you have any questions or feedback - hit up the comment section below.